Driver changes will be a hot talking point in the lead up to the Wilson Security Sandown 500, with teams looking at ways to work within a new rule implemented by Supercars. The rule follows the FIA’s lead, banning elastics on the shoulder straps of the driver belts, which have been used in previous years to help hold the belts out of the way while the drivers switch during a race. The FIA has found the elastics could have a huge effect on driver safety in the case of frontal impact, and Supercars technical and sporting director David Stuart believes it is important for the category to take notice. Most Victorian teams conducted their pre-enduro test days at Winton on Tuesday and spoke about the effect the rule change had and working towards possible solutions to help alleviate the issue in the long-distance races. Stuart said as long as the belts and buckle are not modified, teams are permitted to be creative and find ways to keep driver changes up to speed. “Anything that has the ability to pull the belt up is not allowed,” Stuart told supercars.com. The FIA’s findings were in relation to GT categories, but Stuart believes it’s responsible to follow suit in Supercars. “They’ve found, with a full frontal impact, the driver moves forward and the belts stretch,” Stuart explained. “As the driver recoils after impact, if there’s a secondary impact there’s a possibility of the elastics pulling the belt off the HANS device … therefore you would have no frontal head restraint. While some teams found the change slowed pit stops, in a full fuel stop of about 30 seconds there should be plenty of time for a driver change. It’s the shorter stops, when the car takes less fuel, that teams might be compromised. Whether it makes changes harder or not, Prodrive Racing Australia boss Tim Edwards said Supercars “would be mad” not to adapt to the FIA’s findings. “There definitely were a lot of people sitting on seatbelts and having delayed stops,” Edwards told supercars.com after Tuesday’s test. “But saying that, if it’s a full fuel pit stop that extra 10 seconds they’ve got after they’ve finished their belts is kind of their buffer if they have sat on a belt. So it’ll only be a driver change in a stop that it’s not a full tank that it could potentially hold you up. Brad Jones Racing’s head of engineering Andrew Edwards flagged it early in the day and while the team was looking for solutions he said he wouldn’t be surprised if some were caught out during the high pressure pit stops. “It has brought a lot of complication to the driver being able to get in, so it’s trying to come up with the best system to manage that,” he told supercars.com. However, Holden Racing Team boss Adrian Burgess said his group didn’t experience too much trouble in driver change practice. “No real problems … it certainly didn’t impact on our times from last year to what we are doing, so we are reasonably happy in that regard,” Burgess said. “Even though we’ve taken away the elastics we were still doing driver changes in 14 to 15 seconds, so I don’t think it will impact too much on the performance of the teams. “Like everything, you look for other solutions, and it will be no different with this. 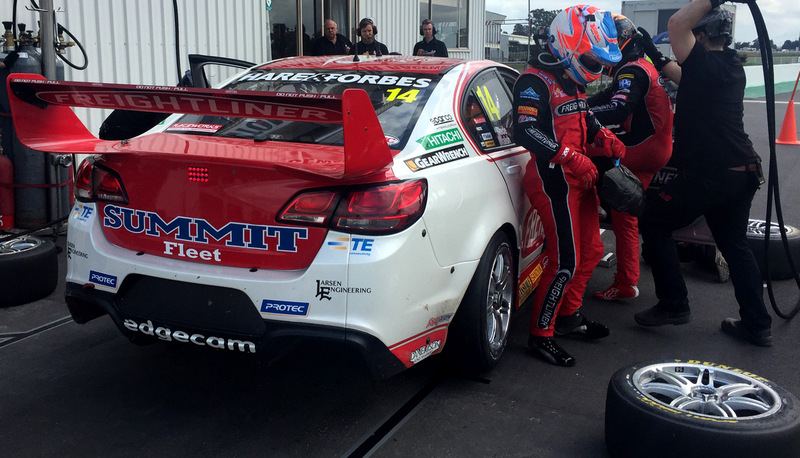 Queensland teams tested yesterday at Queensland Raceway, with Erebus Motorsport and Lucas Dumbrell Motorsport set to run on Tuesday next week at Winton to prepare for enduros.